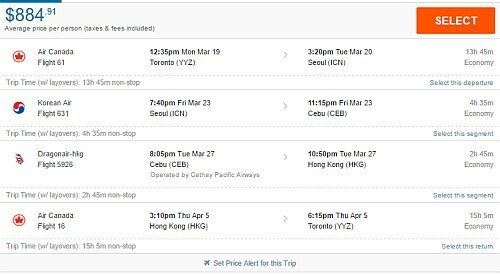 There's another 3-in-1 trip that allows you to fly from Toronto to Seoul, South Korea (spend time there) and then fly to Cebu, Philippines (spend time there) and then fly to Hong Kong (spend time there) and fly home to Toronto - for a total of $884 CAD roundtrip. 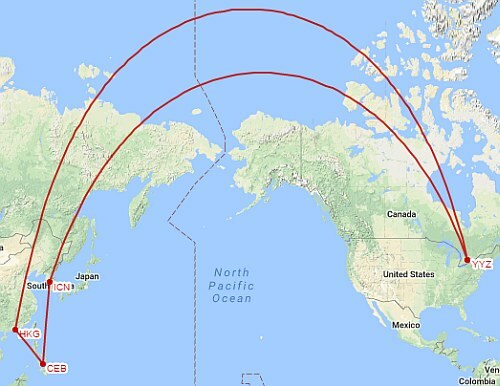 This journey has non-stop flights the entire way, involving flights with Air Canada, Korean Air, and Cathay Pacific. I haven't seen that many date combinations that this actually works for, but you can try your own dates, in order to spend shorter or longer periods of time in each place. I would try starting with dates involving Mondays, Tuesdays, Wednesdays, Thursdays, and Fridays. If you see any other dates that work, feel free to share them in the comments section. toronto, yyz, flight deals, air canada, asia, southeast asia, korean air, east asia, philippines, hong kong, cathay pacific, seoul, south korea, icn, cebu and ceb. One Response to "3-in-1 trip: Toronto to South Korea, the Philippines, and Hong Kong - $884 CAD roundtrip including taxes | all non-stop flights"
Just wanted to say thank you for this amazing deal??????? ?